New Edah for Rising 10th Graders! Below is a letter that we sent out to all of our current 9th grade chalutzim and families. We are proud to share the details of our new 10th grade Edah, and are availible to answer questions via phone or email. Originally we had intended to share this letter with our community while our summer session was still in full swing. However, after the events of the fire on August 7th, we spent the last weeks of camp planning and implementing our “Plan B” at the JCC Ranch Camp. Our kehillah (community) shared a remarkable eight days at our adopted home, and we are so grateful for the support and generosity that allowed us to finish the summer on such a positive and hopeful note. On Wednesday, September 6th, you will be receiving an official announcement about the opening of our 2018 registration. This announcement will include information about our newest edah (age group). It will also explain that beginning next summer, we will only be admitting chaluztim entering grades 9-12 for four weeks. Before sending out this announcement, we wanted share with our 9th grade families more details about our newest edah and explain why we decided to move forward with these changes. For our younger chalutzim, our two-week program is a great way for campers to try out Ramah in the Rockies and see if the program fits their needs. As chalutzim mature, however, our two-week program becomes less effective. Since our older edot participate in longer, more intensive masa’ot (backcountry excursions), they spend less time at base camp. We want to ensure that each and every camper has time to form the deep interpersonal relationships that are at the core of our program. Indeed, over the past few years we’ve found that less than 30% of our older two-week campers return to camp. On the other hand, almost 85% of our older four-week campers return to Ramah in the Rockies year after year. We believe that in the long run, our community and the lives of those affected by it will be stronger if we foster stronger relationships between its members. Sadly, this will mean that some of our chautzim who have split their time between multiple camps and programs will have to decide where to spend their full month. We are committed to raising additional funds for those families who have been coming for two weeks out of a financial necessity. Bogrim has become so big that it is difficult for all of the chalutzim to form deep connections with each other. With larger enrollments, we have seen cliques emerge in Bogrim – something we are fortunate to have rarely seen at Ramah in the Rockies. Additionally, while combining age groups works very well for most ages, the one age group where we see a tremendous distinction in just one year is Bogrim, where some campers are entering high school and others already have completed a year of high school. Campers with a year of high school under their belt often are more mature than those without, and our rising 10th graders deserve a summer experience that reflects their growth and independence. 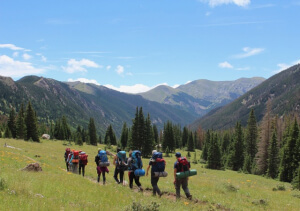 Over the past year, we have been busy reexamining the educational and experiential aims of Ramah in the Rockies, especially when it comes to our high school programs. While JOLI has been (and will remain) the pinnacle of the Ramah in the Rockies experience, we realized that much of the outdoor skill development currently taught in JOLI should be emphasized earlier. We know our rising 10th graders are ready to take on greater challenges, therefore our newest edah will focus on developing outdoors skills, which campers will have the opportunity to practice and perfect on their masa’ot. In 2018, our JOLI program will continue to function like it did during second session of 2017. This means there will be equal emphasis on backcountry skills and counselor-in-training skills. In 2018, we will continue to accept new applicants to JOLI who have not come through the Ramah in the Rockies community. However, beginning in 2019 we expect JOLI to focus far more on leadership skills at our base camp. JOLI’ers will continue to do an intensive 5-day masa for the first masa, but will then spend the second part of camp as “ozrim” (helpers) in a specific program area. They will have the opportunity to co-lead on a masa for one of our younger edot. Starting in 2019, admission to JOLI will be contingent on successful completion of our new 10thgrade edah. Starting in 2018, our rising 10th graders will choose a “major” for each session. In the first year, the four majors will be: farming, biking, survival, and climbing. 10th graders will spend half the day in their major, and half the day working on backcountry skills development and Jewish environmental learning. Chalutzim will also go out on their first masa with their major, led by the same people who have been teaching them at the base camp. This model will allow campers to form close relationships with madrichim(counselors), and find Jewish outdoor role models to learn from and look up to. For the second masa, all chalutzim will go out on an intensive hiking experience in the backcountry, where they will practice the skills they have developed at base camp. Chalutzim will also have a chance to experience their first six-hour solo! We will be constructing a new meeting tent with lights and walls behind the upper bathhouse. This will be a place where our 10th grade edah will be allowed to hang out until 9:30 each evening (an hour later than other campers). Additionally, we expect to add a 10th grade oneg on Friday nights, where chalutzim will be able to celebrate Shabbat with some sweet treats after the rest of the campers have gone to bed. When registration opens, please register for our new edah for rising 10th graders! In the spring, we will send out more specific explanations of the different majors. Once at camp, we will ask each rising 10th grader to rank their choices in order of preference. Stay tuned for our upcoming Naming Contest – all that our new edah is missing is its name, and you can help us chose! This fall, we will be posting a poll and sending out a survey so that every member of our community can make their voice heard and vote for their favorite name. Don’t miss out on your chance to influence the future of Ramah in the Rockies for years to come! We are happy to answer any questions you may have! We’d also love to hear your feedback. In summers to come, we have the opportunity to improve upon the foundation we have established here at Ramah in the Rockies. In order to continue to provide our chalutzim with impactful experiences year after year, we ask that you please take a moment to fill out a brief survey about your child’s experience at camp. Click here to take our 2017 Summer Feedback Survey! We are so excited about our newest edah – we hope you are too!